It was a varied morning for the boys who war game at College. Four of them fought across the skies above Germany in 1943, P51s trying to clear the skies of the ever present Fw190s in preparation for the arrival of the bomber waves. Sadly the Fw 190s were piloted by some of the Reich's best, and the P51s were driven from the skies. The dominant them of the morning was laughter and fun. You can't ask more than that. It was another Saturday morning at the office, but that's how we roll at College. A quick shot of my own progress on this year's painting challenge. The Chaos Defiler is interesting as a kit build. I've pre-painted everything I can on the sprues before I start assembly. This then requires additional touch ups as assembly proceeds in those paces where I've had to file to fit, or where a little too much glue has been applied. 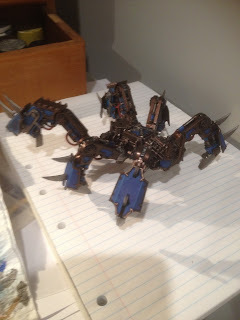 This is the state of play as of last night, with the legs and basic body assembled. I'll leave highlighting etc until assembly is almost complete so that I am highlighting those parts that would naturally reflect light. There will also be quite a bit of detailing to be done at that stage as well.